Today I have some work for you to do, or better yet…. to have someone else do for you. Dishes. Abhorrent chore to do in real life. One I truly despise and as luck would have it… you have to do it fairly often if you actually want to eat. I hate it, so of course I make these things up in SL so I can pass along the fun within a role play experience. Or I’m just that sadistic. We don’t do enough work in real life so I add it for you all in SL. It’s been awhile since I’ve focused too awful much on chores. This week I’m letting you have a brand new freshly meshed chore. A little different, it’s washing dishes but kneeling. A small work table with dishes and things is part of the simplistic set. It would go in a few places I think, maybe. 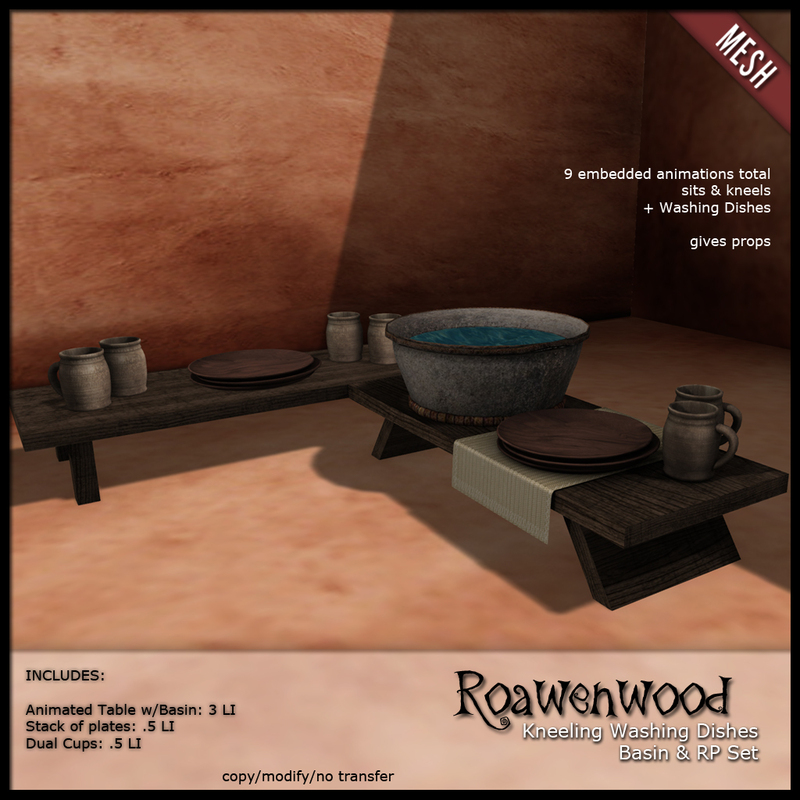 A water basin, dishes and all that you see is included. The table is 3 LI, it is rather cute and there is assorted clutter added to the pack, a stack of plates… and a couple mugs. It has 9 embedded animations in it, no poseballs. The washing dishes anim, then a few various sits, lazy type things and one for a guy even. I doubt really that guy would be there but you never know. I did want to have at least 1 in there he could sit on if that’s the case. Then you can get it in the chores section of the store. Have fun and happy Tuesday!